So, Monday rolls around and we had a refrigerator with Sunday dinner leftovers of roast-beef, potatoes, carrots and peas swathed in an onion gravy. What’s left from our meal is the roast beef, gravy and some boiled potatoes. Usually I would make Stovies (a Scottish dish where you place meat potatoes and fried onions in a pan brown slightly with some lard then add the gravy) but nobody fancied that this evening. Instead I decided to make potato waffles which I served piping hot with the rest of the leftover roast-beef and some baked beans. Every once in a while I like surprising my family with a new recipe creation and this my friends is one recipe that I must share with all of you. This was a new recipe idea for me so it took some trial and error but in the end they turned out just right. Since the potatoes were leftover boiled potatoes and not mashed I did question why I didn’t take the time to mash the leftover potatoes beforehand while they were still warm. That would have made the process of making these potato waffles easier and saved time. I took out the blender and popped in the potatoes to see how well they would mash in a power grinder. Ta Da, It worked perfectly. To the potatoes I added in some milk, salt, pepper and butter which made the mashed potatoes smooth but not too runny. I had to take the spatula to the machine to scoop out the mash. I wanted to add the flour next but without having a recipe I wanted to test the consistency of the potato waffle batter by only making a sample so I didn’t waste the entire batter. Probably one of the biggest food wastes in the world goes to failed recipes which end up in the bin next to everyday food waste that comes out of our homes and restaurants. If you can control food waste then find the best route to keep it to a minimum. I took a small dish and placed a dessert spoon of the mash to a dessert spoon of flour. Did I tell you that I wish I had mashed potatoes as leftovers? Yes… it would have been SO MUCH EASIER. It went all over the place in the waffle machine which meant I had to make the potato waffle batter thicker. So back to the drawing board I went to try and figure out how to make the best homemade potato waffles that my family would love. This time I added enough flour to make a thick batter similar to a pancake batter. Amazingly, I had done it as the batter turned out perfect. I decided to add some strong cheddar in the next waffle and then topping it with more batter. To say that everybody loved it is an understatement as I wish I had put on some more potatoes to make more. You can never have too many leftover potatoes as they are so versatile. Now I know that the next time I make a Sunday Roast dinner that if I make far too many potatoes I’ll be fine because I’ll be turning them into potato waffles. As this potato waffle batter has the consistency of a pancake batter I can’t see why you could not make potato pancakes and top them with butter and maple syrup for a sweet treat. Delicious! Sweet or savoury however you prefer to enjoy your potato waffles you are guaranteed to love the flavour and texture. What would you put on your potato waffles? If you have a waffle machine and leftover mashed potatoes you can easily make homemade potato waffles which can be eaten as a savoury addition to any meal or add maple syrup, fresh fruit, yogurt or butter to enjoy as a treat. Place everything into a blender and mix well until it resembles a pancake batter. If you find that the potato waffle mixture is too sloppy just add a little flour until you get a pancake consistency. Oil waffle iron a little I use a pastry brush to do mine. Then into the waffle iron (or pan if making it pancakes) place 1½ tablespoons of mixture into the waffle iron and close lid. I have my waffle iron set at around 4 but it depends how brown and crispy you like them. Optional: Add cheddar cheese for a special potato cheese waffle. Use 1 cup strong cheese. Place 1 tablespoon of potato waffle mixture first then cheese and then top with a bit more batter as this keeps the cheese inside the waffle. You can also add all sorts of herbs to the potato batter before using the waffle iron. You can add cumin, parsley, spring onion etc. 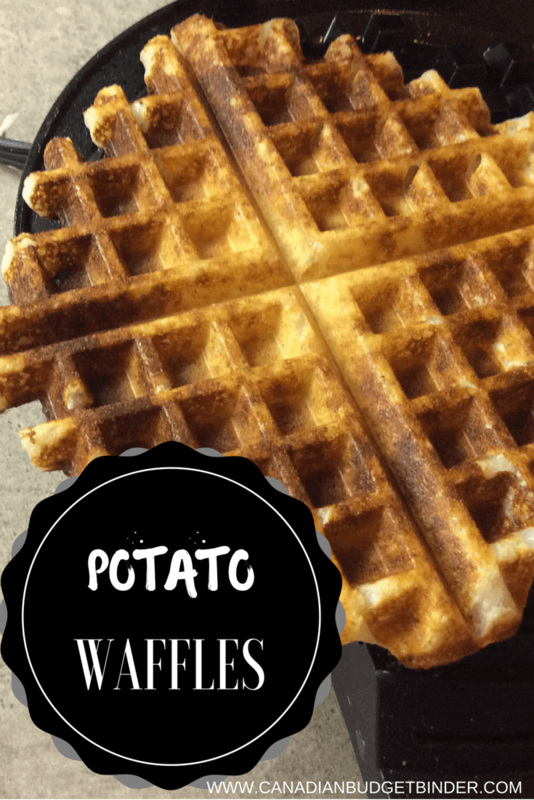 These potato waffles are easy to make and freeze well. When you want to enjoy them remove from the freezer and to reheat just pop them into the toaster for a great start to the morning topped with scrambled eggs! Now that’s a breakfast worth prepping for in advance. This looks yummy!! What usually happens when there are roast leftovers here is it all gets worked into a shepherds pie type of dinner, topped with grated cheese of course for my two legged mice here!! Roughly how much already mashed potatoes do you think this would use or do I just ball park it?? It would likely be pancakes here as my poor old waffle maker died of overwork a while back so I’ve been eyeing the sales at Canadian Tire so I can get my points there. It’s on my wish list and the kids know it, but Mothere’s Day is coming! Might have to start dropping hints…lol!! Lol. If you are using mashed potatoes I would gradually add in the flour to see how thick it becomes. Everybody makes mash differently so if it becomes to thick after the flour is added then just add a little milk. I’d start dropping those hints now too lol!